It is the number of protons found in the nucleus of an atom. It is conventionally represented by the symbol Z. The atomic number uniquely identifies a chemical element. When an atom is in neutral charge, the atomic number is equals to the number of electrons. Atoms of the same element having the same number of neutrons but different number of protons. Isotopes have different atomic number but same atomic mass. e.g. 12C6 and 14C6 where 12 and 14 are the atomic number of Carbon Isotopes 6 is the Atomic mass number. Atomic weight is an older term; usually it is called atomic mass now. Atomic mass is the most accurate mass that scientists can figure out for the weighted average of all isotopes. It is the weight of an isotope relative to the weight of isotope of carbon whose atomic mass number is 12. The periodic table is a tabular arrangement of the chemical elements, organized on the basis of their atomic numbers, electron configurations (electron shell model) and recurring chemical properties. Elements are presented in order of increasing atomic number. The rows of the table are called periods; the columns are called groups. Russian Chemist, Dmitri Mendeleev is generally considered to have developed the periodic table in 1869. He developed his table to illustrate periodic trends in the properties of the then-known elements. The periodic law: the rule that the behavior of the elements may be predicted from their positions on the table is known as the periodic law. 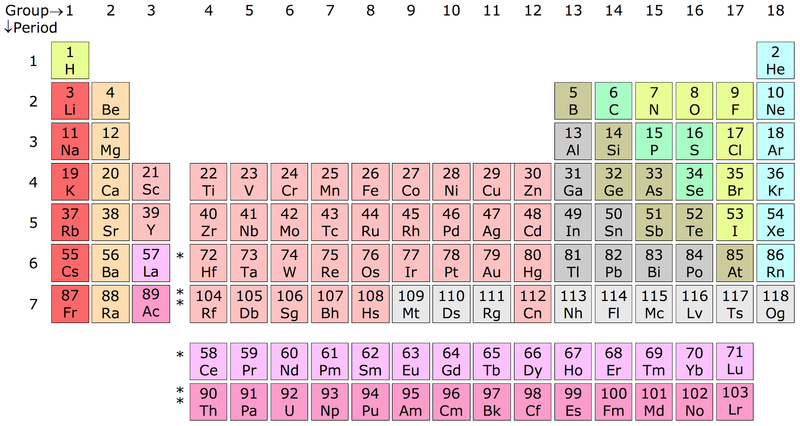 Classes: the periodic table uses column to indicate classes of elements having similar properties. Groups: the vertical columns of elements in the periodic table are termed as groups. According to IUPAC these groups are numbered from 1 to 18. Alkali metals: They are members of Group I of the periodic table. They are very reactive metals and do not occur freely in nature. These metals have only one electron in their outer shell. The alkali metals include: Lithium (Li), Sodium (Na), Potassium (K), Rubidium (RB), Cesium (Cs), and Francium (Fr). Alkaline Earth metals: They are members of Group II of the periodic table. They form strong bases or alkaline solutions. They are named as earth metals because of the incombustibility and insolubility of their oxides. The alkaline earth metals are beryllium (Be), magnesium (Mg), calcium (Ca), strontium (Sr), barium (Ba), and radium (Ra). All the discovered alkaline earth metals occur in nature. The alkaline earth metals are all silver-colored and soft, and have relatively low densities, melting points, and boiling points. Lanthanides: are the chemical elements that follow Lanthanum in Group III B of the periodic table. Their distinguishing atomic feature is that they fill the 4f electronic sub-shell. In principle the elements having atomic numbers between 58 to 71 come under the lanthanide series. The term “lanthanide” was probably introduced by Victor Goldschmidt in 1925. Lanthanides are also sometimes referred to as “Rare Earth Metals”. Lanthanides are found in many minerals principally Monazite. Pure lanthanides are silvery metals with high melting points. They tarnish slowly in air except Samarium (Sm) Ytterbium (Yb) and Europium (Eu). The metals are prepared from fluorides or oxides by treatment with strongly reducing metals like calcium or from molten chlorides or fluorides by electrolysis. Actinides: these are the elements that follow Actinium group III B of the periodic table. Actinides have large unstable nuclei that release huge energy upon undergoing spontaneous fission. All the Actinides are radioactive. Most of them are artificially produced in the laboratory. Interestingly, two actinides have half life such that they have not completely decayed since the beginning of the earth. They are Thorium and Uranium. Thorium-232 has a half life of 14 billion years. Its abundance on earth’s crust is 12ppm. Three isotopes of uranium: (i) U-234 – half life of 230,000 years; (ii) U-235 half life of 696 million years and (iii) U-238 half life 4.51 billion years. The abundance of Uranium of earth’s surface is 4ppm. Actinium and pro-actinium and some isotopes of thorium and uranium are found in nature as the decay product of Th-232, U-235 or U-238. Radioactive substances can harm human health via (i) local skin contamination, (ii) internal exposure due to ingestion of radioactive isotopes, and (iii) external overexposure by β-activity and γ-radiation. Together with radium and transuranium elements, actinium is one of the most dangerous radioactive poisons with high specific α-activity. The Actinides are: Neptunium Plutonium Americium Curium Berkelium Californium Einsteinium Fermium Mendelevium Nobelium Lawrencium. Nobel gasses: the inert or noble gasses are a family of gaseous elements that comprises group 0 of the periodic table. Their physical and chemical properties are closely related. The six noble gases that occur naturally are helium (He), neon (Ne), argon (Ar), krypton (Kr), xenon (Xe) and the radioactive radon (Rn). Together they constitute less than 1% of the earth’s atmosphere. They are called inert gases because they (usually) do not take part in the chemical reactions or chemically combine with other elements. This stability is the result of completely filled valence shell. The ability to form compound increases with the increase in the atomic number. Xenon forms compound that are stable at room temperature.